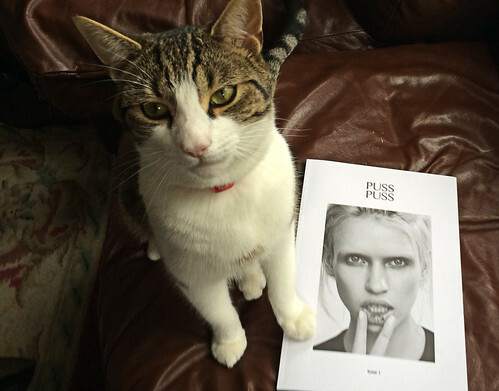 Puss Puss is a new, London-based magazine, and a welcome addition to the surprisingly large independent pet publishing scene, writes Holly Catford. The title was launched in July by designer Maria Joudina-Robinson. Puss Puss may not always feel like a magazine about cats, but cats provide the thread holding everything together, including the fashion. Photography by Jon Gorrigan. Styling by Magdalena Bryk. Model, Anja Konstantinova, wearing a Silken Favours cat scarf. 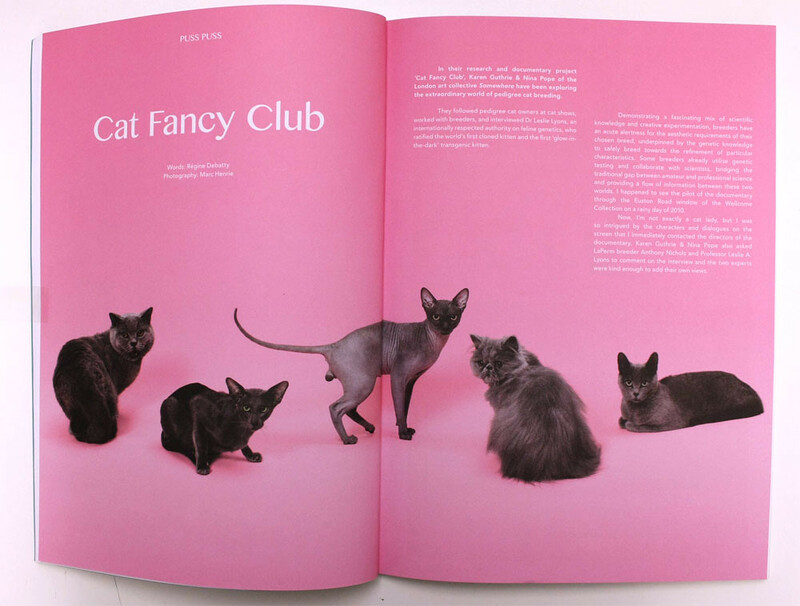 Top: Spread from ‘Cat Fancy Club’, written by Régine Debatty with photography by Marc Henrie. Spread from a feature about former model and animal activist Celia Hammond. Colour photographs by Matt Robinson. Archive fashion picture shows Hammond (right) in 1965 with Pattie Boyd, photographed by John French. 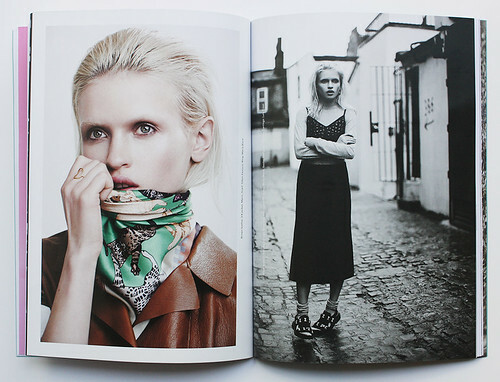 Cover image by Jon Gorrigan of model Anja Konstantinova. However I was puzzled by the un-cat-centric cover, the only aspect of the Puss Puss that doesn’t work. A braver move would have been to put a cat on the cover, big and proud. The magazine itself is well produced, with paper changes that complement the full bleed images. Jean Jullien’s funny illustrations – of ‘Grumpy cat’, ‘Colonel Meow’ and ‘Lil Bub’ – are very welcome. 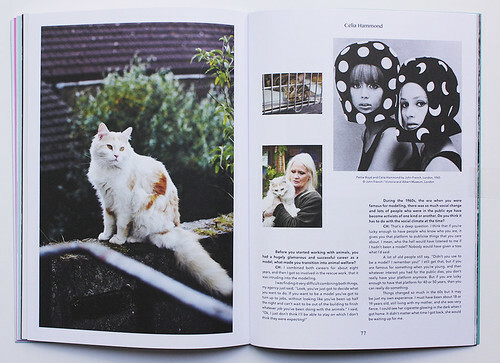 Marc Henrie’s photographs of blue-coated cats for ‘Cat Fancy Club’ (top) bring some colour to the sparse layouts. 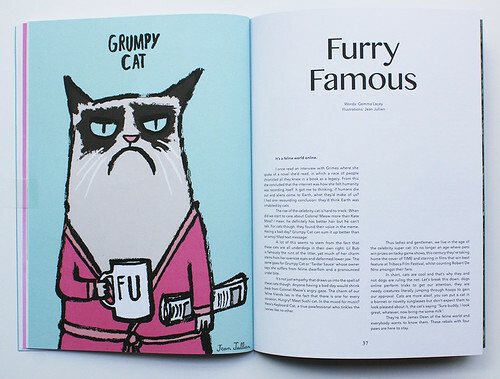 Spread: ‘Furry Famous’ written by Gemma Lacey and illustrated by Jean Jullien. Left of spread: Josephine Baker; Diana and Reed Vreeland photographed by Irving Cantor; Veronica Lake; and Alan Ladd in the film Saigon. Right side: Bettie Page photographed by Bunny Yeager. 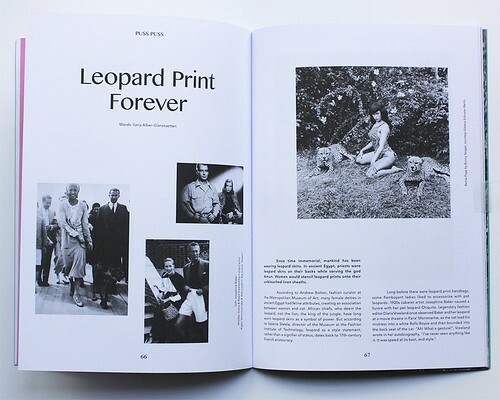 An article on the rise of the leopard print in fashion is a fascinating read, with well chosen archive photography. Spread: Ai Weiwei photographed by Matt Robinson. The big show-stopper story is an original interview with Chinese artist Ai Weiwei, who looks after approximately 30 cats in his compound in Beijing. 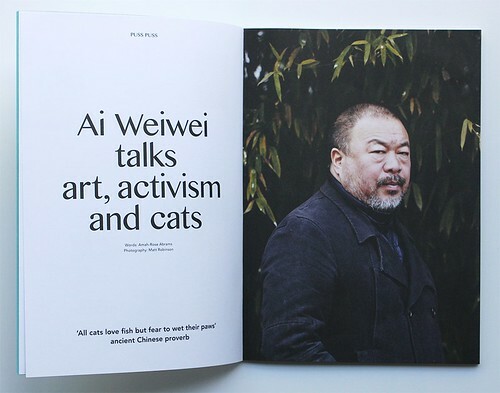 We learn from a caption that Weiwei has a huge ginger cat named Garfield. Holly Catford’s cat George adopts a critical stance towards issue one of Puss Puss. Holly Catford, designer, Esterson Associates; art editor, Pulp, Catford.